At today’s end, I will have completed my calligraphic marathon. Signpainting yielded to lettering on muslin for our annual Poetry Trail. Visitors will arrive later to film a promo in my studio—more about this another time. The following little experience happened during the intensity. I wrote it on the spot and mailed it to my sister Robin the next day. May you notice such a moment of perfection and drop a line to one who made it possible, thereby creating another moment of perfection. 11:08 pm. So, I am finished with a stimulating, exhausting day in the studio, big deadline, good work accomplished, much learned, much to forgive and absolve in my work, and I can work no more. I grabbed a hummus wrap at 5 which fueled 5 hours of work, but now at 10:30 I’m hungry. John’s coming in on the midnight train, so it makes sense to eat. Hmm. Leftovers in the fridge don’t appeal. But I have that aged gouda, some crusty bread, some olives. A glass of red wine. A lovely, simple ancient meal. But wait! Yes, there’s some left. Enough for a handsome scoop in a little dish—and what perfection it is. 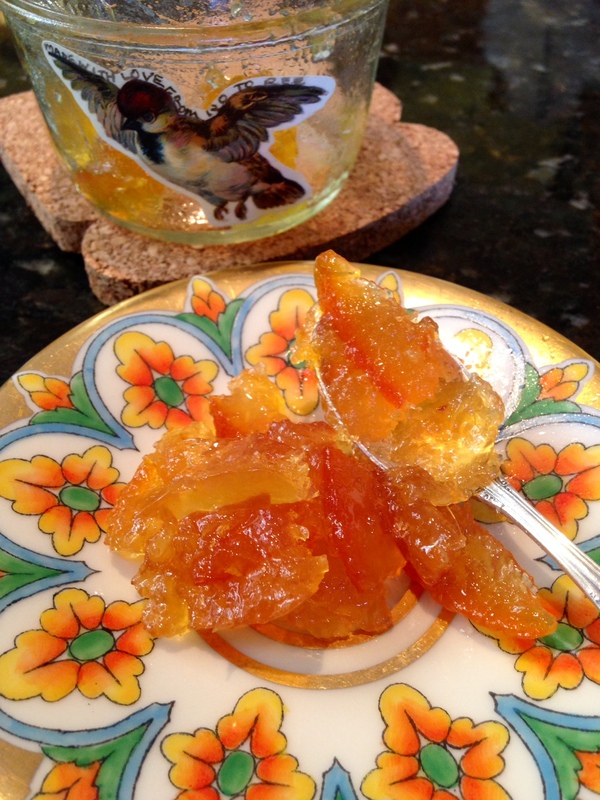 My sister’s wondrous rindy marmalade. Can you taste it with this flaking cheese? Bracing wide nuggets of bittersweet orange, superb with the olives. Food that revives. Oh, yes.